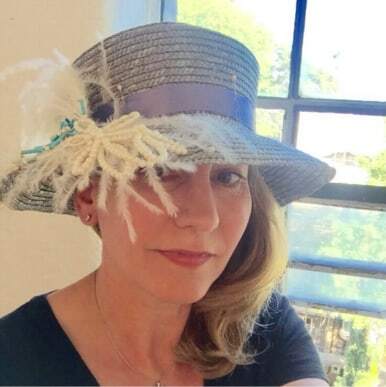 How To Make A DIY Hat For Ascot. How To Make The Perfect Vintage-Inspired Hat For Ascot. 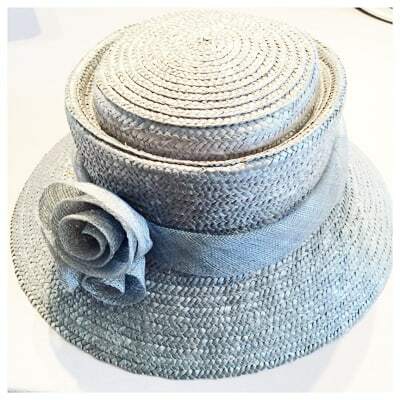 Royal Ascot kicks off today and in honour of the occasion this week’s blog will teach you how to make a hat for the Ascot Races! 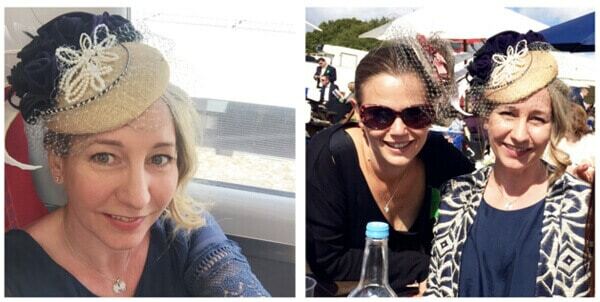 A couple of weeks ago I went to The Epsom Derby with a group of friends to celebrate my friend Vicki’s Birthday. I was very proud to wear one of my own birdcage veil hats and gave one to Vicki as a Birthday present. Here’s a couple of pictures of our day! I was expecting a lot of beautiful millinery but was a little bit dissapointed to note that a lot of the fascinators worn were very samey. And when I had a flick through the internet I realised that a lot of the high street fascinators are all of a similar ilk. So with Ascot kicking off today, where do you go to get a hat for the races if you’re only going to wear it once and want to keep it affordable? Option 1. 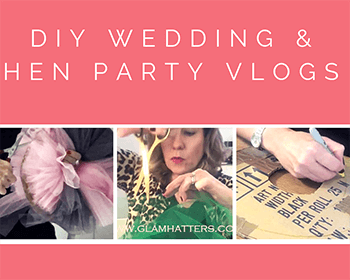 Follow my Glam Hatters step-by-step workshop and video tutorial below and make your own hat for the races at home. Option 2. 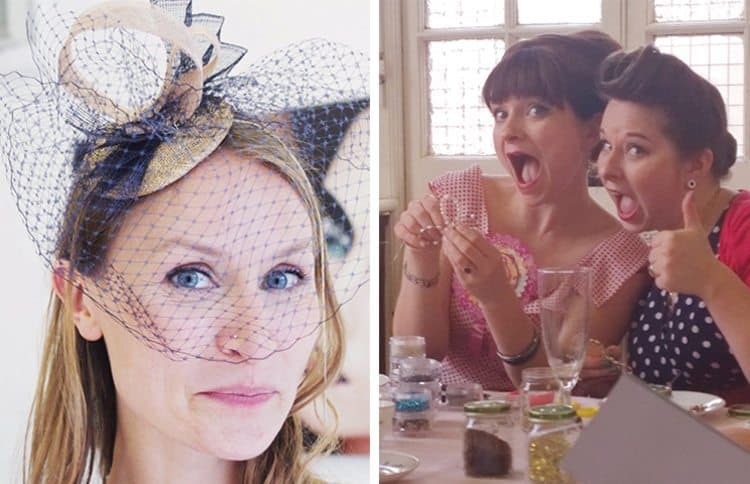 If DIY crafting is not your style, come to a Glam Hatters’ vintage-inspired fascinator making workshop and learn from The Glam Hatter Girls. Option 1. How To Make A DIY Hat For Ascot. Step 1. Find Your Fascinator Base. My first stop was Oxfam! 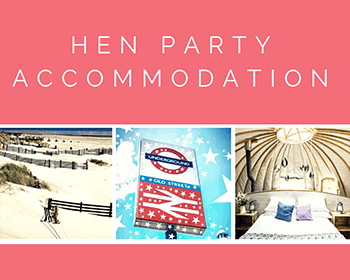 It might be luck or charity shops might be full of them but I found this fabulous little hat – I had to use my imagination and a bit like re-decorating a house, I had to strip it down to add fabulous feathers and vintage-style decorations to bring it to life! Step 2. Remove The Original Millinery Decorations. I started by removing part of the flower decoration to see if I could play around with the shape, but it just looked too high street so I cut them off altogether! Then I thought I might leave the original hat band on but after trying it out with the feathers I decided it just wasn’t that lovely so also cut that off completely. Step 3. Decide On Your Hat Band. I then tried out some different coloured silk ribbons, eventually deciding on the grey silk I pinned it to the hat folding the end underneath. Step 4. Choose Your Feathers. 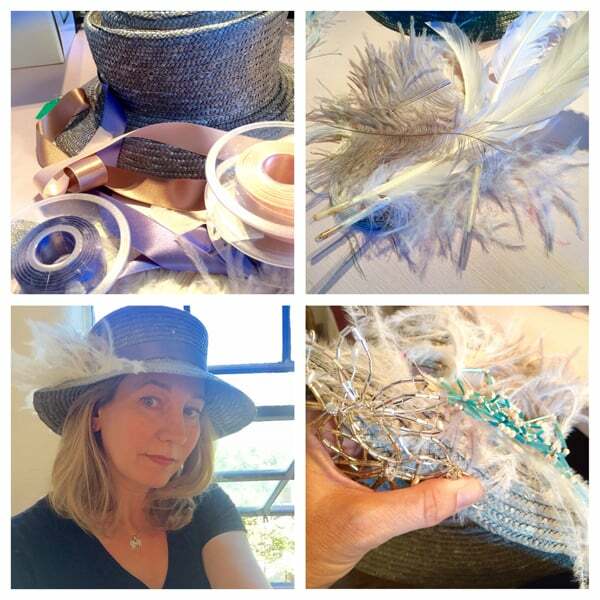 Then I up-ended one of my Glam Hatter hat boxes full of luxury feathers (used on the Luxury Vintage Fascinator Hen Party Workshop) and decided on white ostrich feathers to soften the look of the hat. You can find feathers at John Lewis or for a more professional look try Macculloch & Wallace(Oxford Circus Tube). Step 5. Create Your Vintage-Inspired Pearl Decoration Using My Glam Hatters’ Video Tutorial. 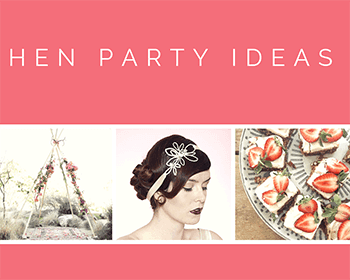 I then grabbed my bead box (the one I take along to our Gatsby Inspired Hen Party Workshop) and using 4mm wire and lots of pearls created a fabulous vintage inspired decoration to add to the hat. You can find the pearls and wire at The Bead Shop in Kentish Town. It’s very close to my house so you may even bump into me in there! Step 6. Add Your Pearl Decoration To The Hat Brim. I made up some vintage-inspired decorations in different colour ways, one was a mix of blues and another all pearls. And in true Glam Hatter style I added both. Sometimes more is just, well more! This is me in my studio wearing my incredibly affordable hat. It cost me £8.99 to buy the hat from Oxfam and I added feathers and decorations (which I made myself) along with some silk ribbon. I think you’ll agree it’s lovely to wear something that is a reflection of your own style and the other massive plus is that you won’t bump into anyone else wearing the same thing! Option 2. 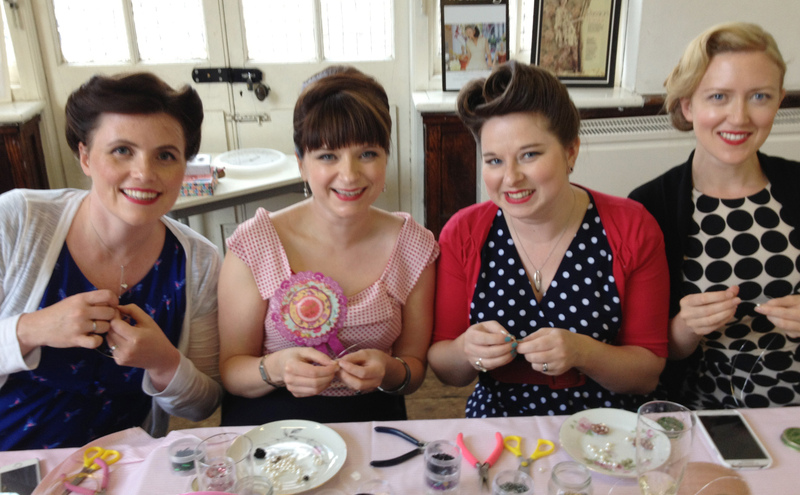 Come to a Glam Hatters Vintage-Inspired Fascinator Making Workshop and learn from The Glam Hatter Girls. I hope you enjoy this post and please do Facebook me with your results, I’d absolutely love to see. 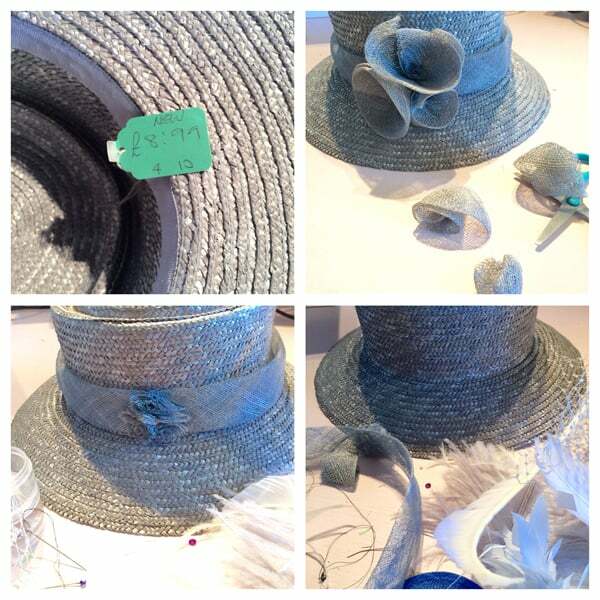 If you decide a Glam Hatters’ Workshop is more your thing (step-by-step tuition, fabulous afternoon tea, 1920’s tunes in the background, candy stripe table-cloths!) 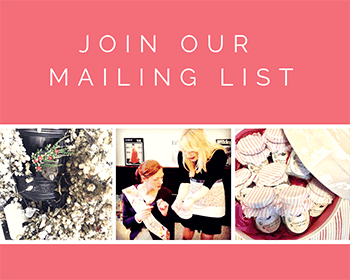 Please do email me and I will give you the full details. 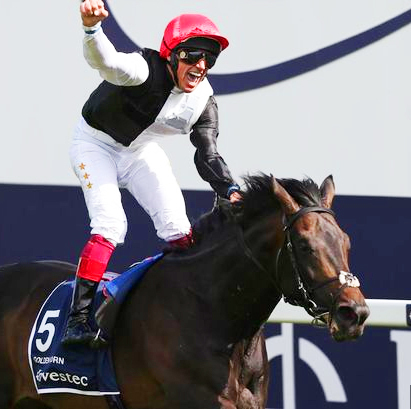 I wish you a fabulous Ascot and that you and your chosen horse are unstoppable! 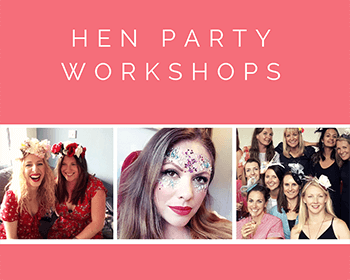 For Glam Hatter Workshops, click here. 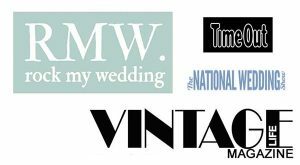 For Macculoch & Wallace millinery supplies, click here.